The man in the white coat? Really? It’s come to this again? Orioles pitcher Jason Hammel, who gave up four solo homers to Jays hitters in a 4-1 loss Wednesday night said he thought the Jays hitters were tipped off to what was coming. LIVINGSTONE: I can respect a player a lot more when they get roughed up and take it like a professsional – I’m not perfect and these kind of games are going to happen. 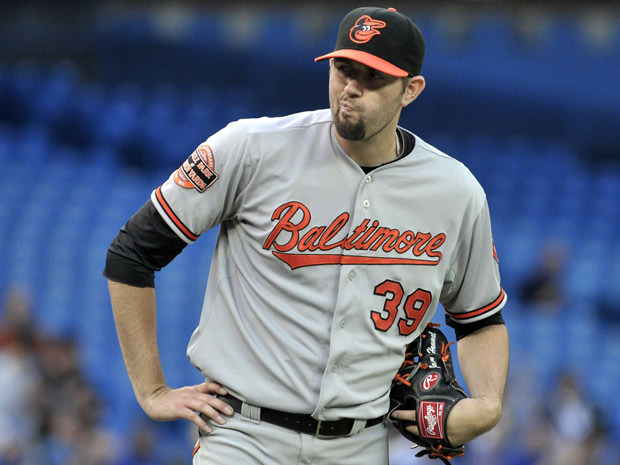 Whatever respect there is to be had for Orioles pitcher Jason Hammel – and to be honest, there is not too much considering he’s a mid-level pitcher who has never really had a statistically solid year – it’s all but gone now. Fans don’t want to hear excuses, but following the 4-1 loss to the Jays Wednesday night in Toronto where Hammel (6-2, 3.06 ERA) gave up four solo shots to Brett Lawrie, Edwin Encarnacion, Rajai Davis and Colby Rasmus. Post-game, Hammel made reference to the ‘man in the white suit’ story that broke last year where a, well, man in a white suit was alleged to be tipping pitches to Jays hitters from the stands at the Skydome. Of course, the story was vehemently denied by Jays management right down to the players in the clubhouse, calling it as they saw it: a ridiculous accusation with no substantiated evidence to even prove it was true, outside of a few opposing players saying it was happening. There is a lot of luck in baseball. Sure, baseball is built around talent and studying pitchers and hitters to adjust appropriately to the situations a player is placed in. However, sometimes hitters get lucky with aggressive swings maybe considered to be outside the regular scouting report of a hitter and/or team. In recent years, Jays hitters have been known to be aggressive power hitters who are looking to park the ball. Looking at Hammel’s career in the majors, one could argue maybe he is cheating. With a 40-47 career record and an era of 4.84, Hammels has never been as good as he has been this season. He’s only had winning records in two seasons in the big leagues (10-8 in 2009 and 10-9 in 2010) followed by a 7-13 record in 2011. He’s never been close to an ERA below 4.00 (4.33 in 2009 was the lowest he’s had in a full season), and in fact, has been closer to 5.00 than anything. To call out a team for ‘cheating’ after they tag you for four home runs (he has now given up seven in total this season) is low. No one in the world of baseball expected the record, ERA or quality that Hammels has shown this season – in fact, giving up four home runs in one game was something people might have thought was more likely from him. Take your lumps when they come like a professional and don’t make excuses for the fastballs you left over the plate for aggressive hitters to take for a ride. I just don’t understand why Hammel didn’t chalk it up to getting beat by an aggressive team at the plate. Sure, nobody ever wants to admit they were bested, but attributing it to an outside source is a low blow.